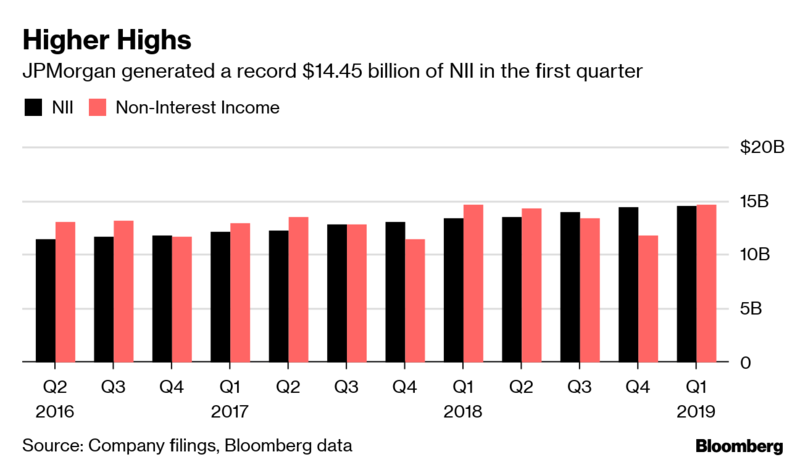 JPMorgan Chase & Co. (JPM.N) said net interest income -- revenue from customers’ loan payments minus what the bank pays depositors -- jumped to US$14.5 billion in the first quarter, a record aided by the Federal Reserve’s four interest-rate increases in 2018. The bank reiterated its forecast for US$58 billion of interest income this year, a US$3 billion jump from 2018. Fed Chairman Jerome Powell has indicated rates are probably on hold for the foreseeable future, and analysts are predicting the first quarter was probably the last for now to get a boost from monetary policy. “Even amid some global geopolitical uncertainty, the U.S. economy continues to grow, employment and wages are going up, inflation is moderate, financial markets are healthy and consumer and business confidence remains strong,” Chief Executive Officer Jamie Dimon said in a statement Friday. NII has been a key driver for revenue in recent quarters across the industry. The first quarter’s 1 percent increase from the fourth quarter was better than the company’s forecast that the figure would be flat. Trading revenue dropped 17 per cent to US$5.5 billion, slightly better than analysts’ estimates of an 18 per cent decline. Both equity and fixed-income trading fell. Shares of the company, which gained 8.8 per cent this year through Thursday, rose to $108.25 at 7 a.m. in early trading after closing at US$106.23 on Thursday. Non-interest expense rose 2 per cent to US$16.4 billion, the highest since the third quarter of 2013. The bank has been funneling a portion of profits into new technology, branch openings and its equities-trading business. That could lead expenses to jump by more than US$2 billion in 2019, JPMorgan said in February. Net income jumped 5 per cent to US$9.18 billion, or US$2.65 a share, from US$8.71 billion, or US$2.37, a year earlier. Analysts surveyed by Bloomberg had forecast adjusted earnings of US$2.35 a share. Revenue on a managed basis increased 5 percent to $29.9 billion, beating the $28.4 billion average estimate of 18 analysts surveyed by Bloomberg.